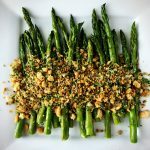 Tender asparagus, salty cheese, crisp crumbs, zesty mustard and aromatic herbs make this a stellar side dish. Serve alongside grilled chicken or fish. Preheat the oven to 400°F. Place the rack in the upper third. Line a baking sheet with parchment paper. In a bowl, stir together the bread crumbs, Dijon, mustard seeds, thyme, 1 1/2 Tbsp of the olive oil, and a big pinch of salt and pepper. Spread on the baking sheet and bake until toasted, about 10-12 minutes, stirring once or twice. Transfer to a mixing bowl and let cool completely. When the bread crumbs are cool, add the lemon zest, Parmesan and parsley. Turn the oven temperature up to 425°F. Arrange the asparagus on a parchment lined baking sheet, and toss with remaining olive oil and garlic. Season with salt and pepper. Roast until the asparagus just starts to blister, about 10 minutes, though the time may vary depending on the thickness of the stalks. 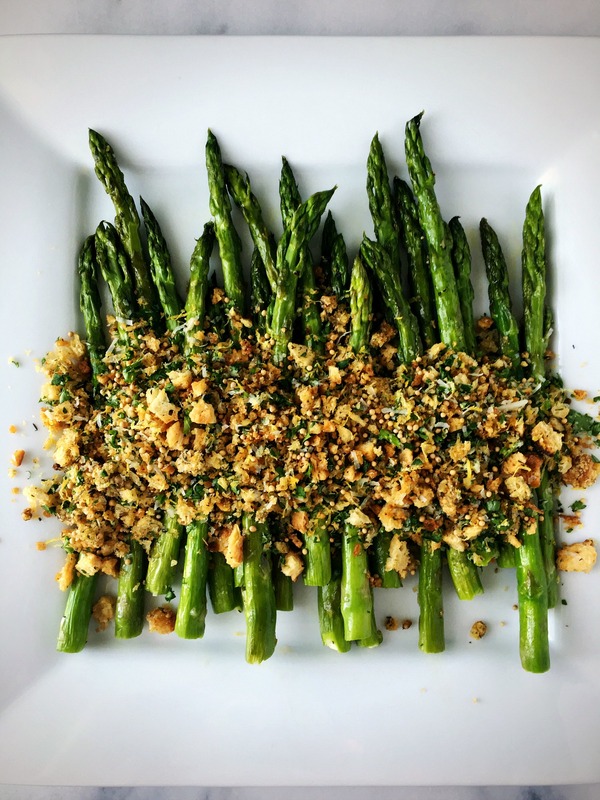 Transfer the roasted asparagus to a platter and spoon the breadcrumb mixture over top. Serve warm, and best eaten immediately. If you have an end of a baguette or any fresh bread that has dried out, break it into a few pieces and pulse it in the food processor until you get very coarse crumbs. Use asparagus with medium width.